This beautiful hand-drawn Remarque by Simon Atack appears at the bottom of this Medal of Honor Edition print. Medal of Honor Edition with Remarque from a sold out 2005 publication. 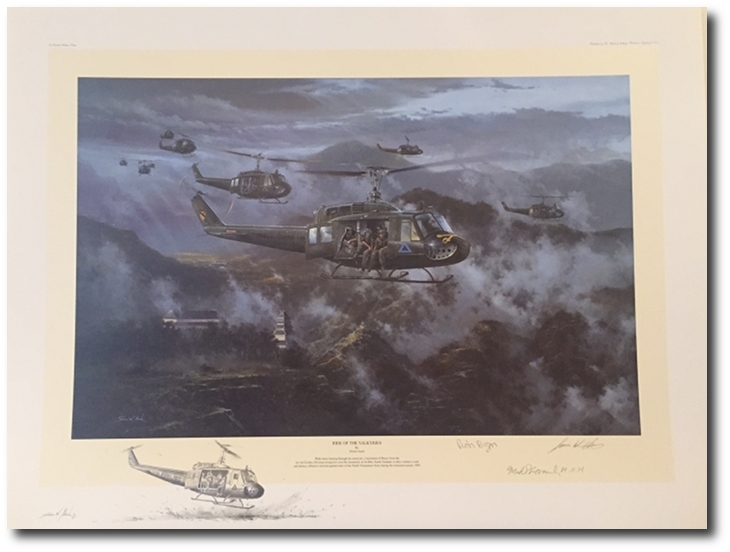 Overall size: 31 1/8" x 23 1/2"
Image size: 24 5/8" x 16"
An outbound seek-and-destroy Huey-slick mission is flown by a ten-ship formation of the 229th Assault Helicopter Battalion, 7th Cavalry Regiment, 1st Air Cavalry Division, almost immediately after the unit first arrived in South Vietnam during the monsoon season. 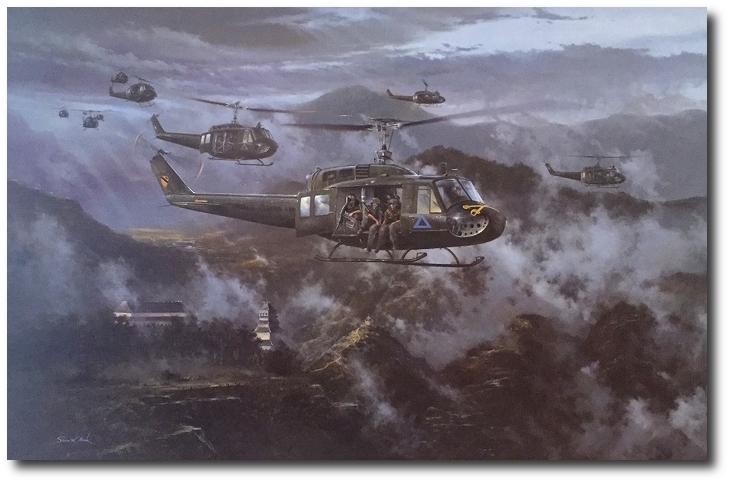 With the rotors beating their unforgettable thunderous 'whoop', the Huey's fly down a mist-shrouded valley and over the Cao Dai Monastery at An Khe. On 14 November, this famous Regiment fought the US Army's first major battle against the North Vietnamese Army in the Ia Drang Valley in one of the bloodiest and fiercest actions of the entire war. Michael J. Novosel, Sr. (September 3, 1922 � April 2, 2006) of Enterprise, Alabama served in the United States military in three wars: World War II, the Korean War and the Vietnam War. 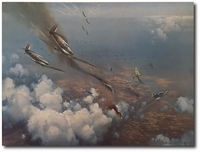 He flew the B-29 Superfortress bomber in World War II. In order to serve in the Vietnam War, he gave up the rank of lieutenant colonel in the Air Force Reserve to become a chief warrant officer in the Army. For his bravery in conducting a medical evacuation under fire in this conflict, he was awarded the United States' highest military decoration, the Medal of Honor.